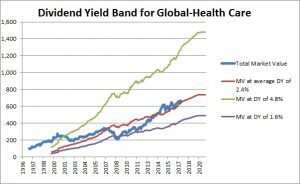 Some funds are managed on a global sector basis rather than on country basis. We provide research on global sectors to cater to these types of funds. 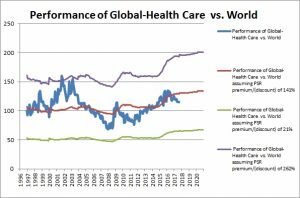 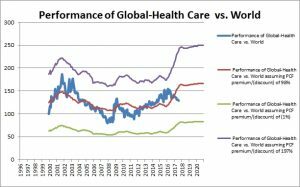 The following is an example of an analysis done on the global health care sector. 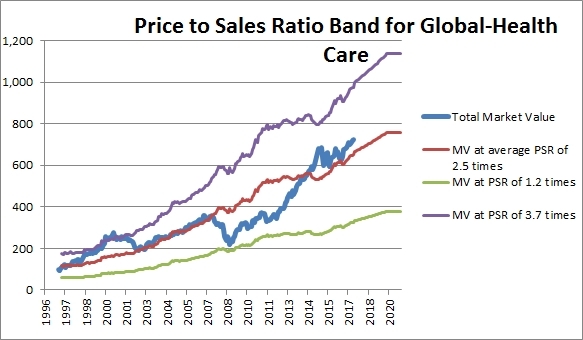 The first thing we do is to determine the absolute performance of the sector in the next few years by looking at its valuation and fundamentals. 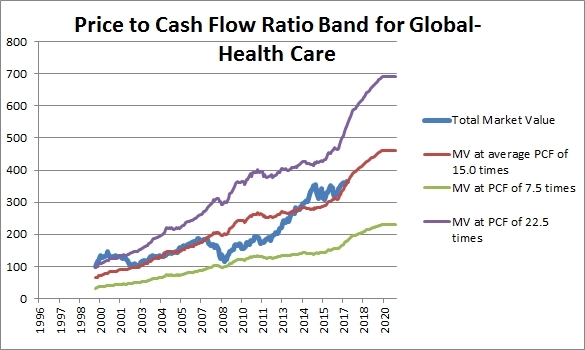 Based on the following chart, the global health care sector historically traded at an average PE of 21.2x and is now currently trading near its average valuation (as indicated by the blue line sitting on the red line). 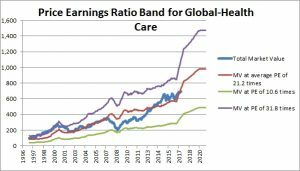 Earnings growth is strong (as indicated by the steep rising red line). 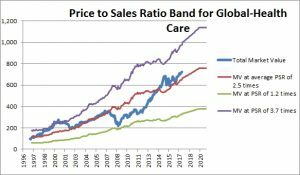 We do this analysis for the other valuation indicators – Price to Sales, Price to Book, Price to Cash Flow and Dividend Yield – and find that valuation is reasonable for all except Price to Sales, which indicates slight overvaluation. 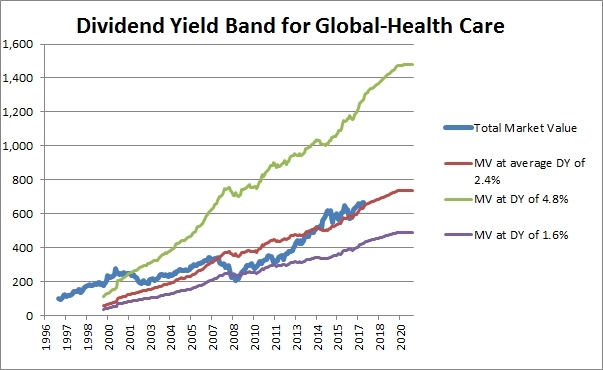 Since the different indicators may give us slightly different readings (e.g. 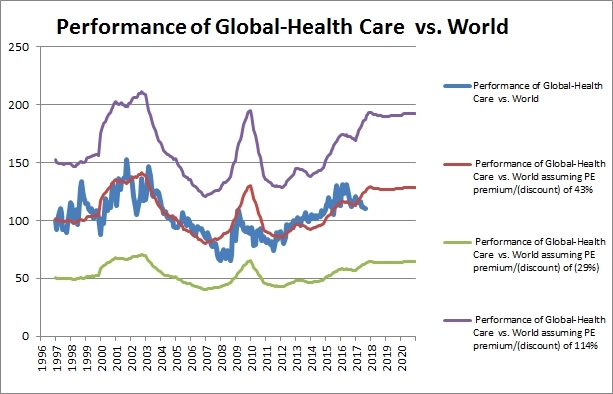 Price to Sales ratio show global health care sector to be slightly overvalued while the rest of the indicators show fair valuation), we create a Composite Valuation Indicator that gives a final conclusion by taking the best combination of the five indicators as seen in the chart below. 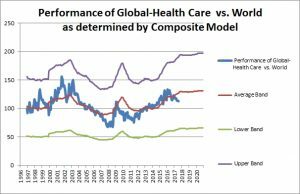 Based on the Composite Valuation Indicator, the outlook for the global health care sector is positive. 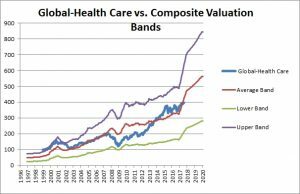 Valuation is fair and fundamentals are healthy. 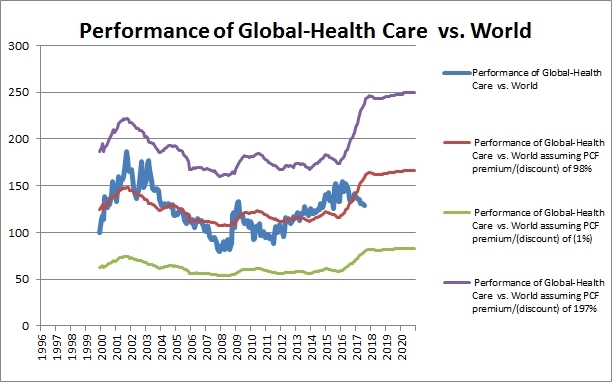 The above study gives a clue as to the future absolute performance of the global sector. 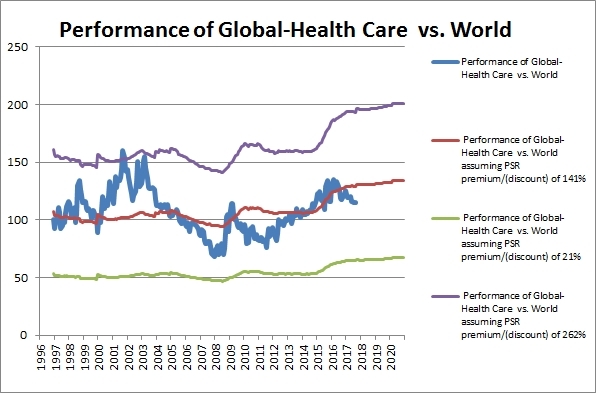 In order to determine whether this sector will outperform global equities (i.e. 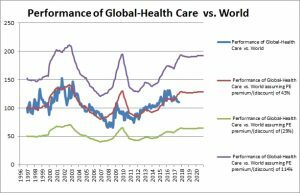 its relative performance), we compare the valuation and fundamentals of the sector with that of global equities. 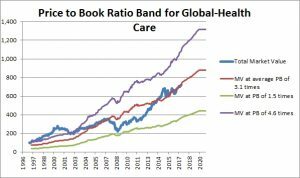 There are only two reasons why the sector will outperform the general market. 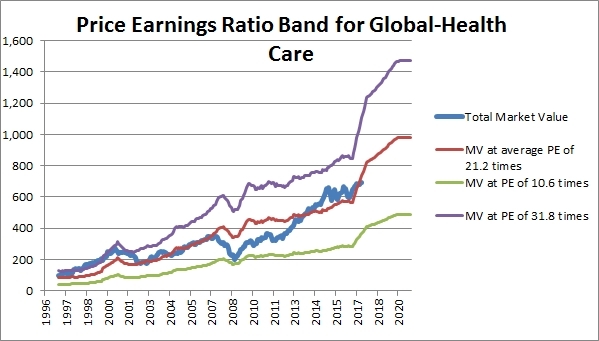 For example, if we value the sector using PE, Sector A will outperform the general market when PE Ratio of Sector A divided by PE Ratio of the general market goes up OR earnings growth of Sector A is higher than earnings growth of the general market. 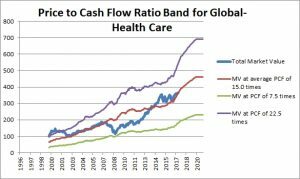 The above reasoning would be true for the other market indicators such as Price to Sales, Price to Book, Price to Cash Flow and Dividend Yield. 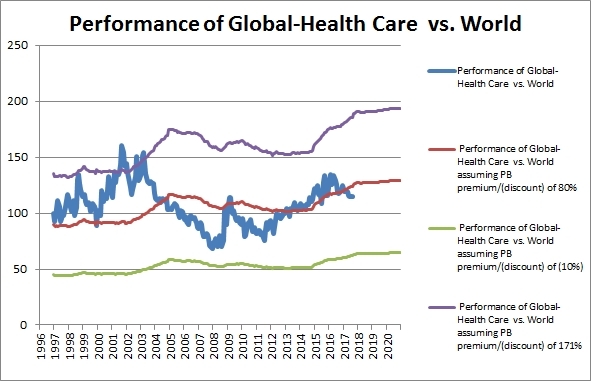 From the chart below, we see that the sector historically traded at a PE premium of 43% to world equities and is now trading below that. 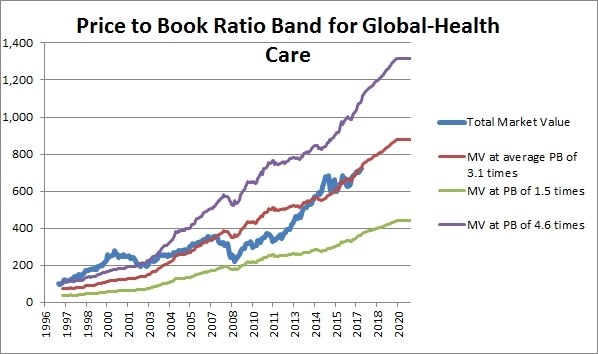 Fundamentals of the sector is only slightly better than world equities. 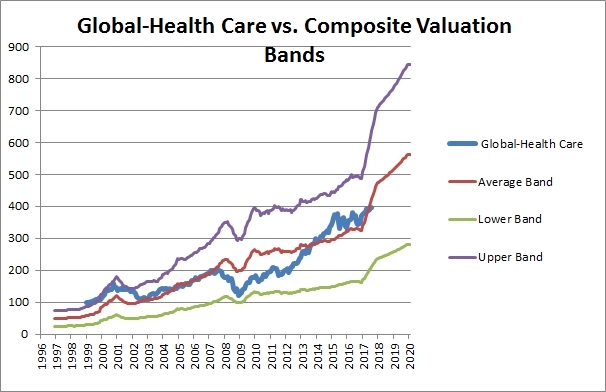 The same analysis is done for the other valuation indicators. 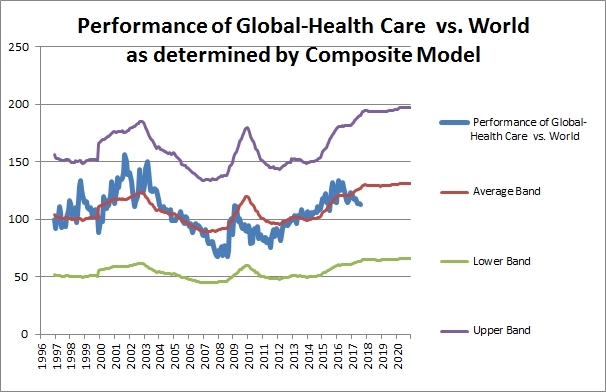 Finally, we have our Composite Model to give a final conclusion on expected relative performance of the sector vs. world equities.